Okay, we might not have even had Halloween yet, but it’s not too early to start thinking about Christmas. If you’re stumped for ideas for your child then check out this list of our top toy picks. We’ve scoured the online retailers, watched the YouTube unboxing videos, and chatted to real life Mums and kids to see what will be the favourite toys that children will receive in this year’s haul. There are some classic brands on the list, as well as some more innovative choices. Let’s just hope that Santa thinks you have all been good this year! The cute interactive monkey fingerlings were a big hit last year and this year WowWee toys have released a dinosaur range. 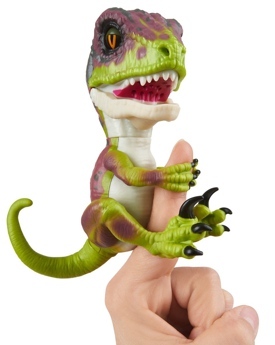 This small animatronic beast grasps onto your finger and reacts to sound and touch. They even have two modes. In tamed mode, the dinosaur is your friend and will make purring noises, whilst in untamed mode you can expect growls, gnashing of teeth, and roaring. Why We Love It: With around 40 different responses, this is a toy that will entertain your child for hours. It’s particularly good for long car journeys and is small enough to take to restaurants for easy entertainment. Why Our Kids Love It: It’s one of the biggest playground crazes at the moment, with all their friends adding it to the Christmas list. 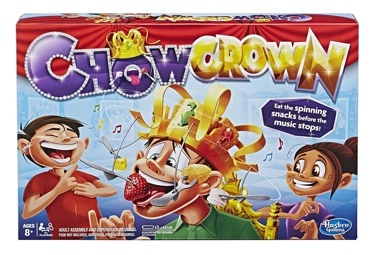 One of Hasbro’s newest additions to its mega selection of family board games, Chow Crown is a hilarious party game for the whole family. It seems like a fairly simple idea. There’s a crown with a number of forks attached to it. You place items of food on each fork and the player places the crown on their head. Press the button and some music starts, and the forks begin to spin. The player must try and eat as much as possible off the spinning forks without using their hands before the music ends. Why We Love It: It’s great entertainment that can bring the whole family together. It will be fabulous on Christmas Day evening when you want to have a light snack and entertain the kids at the same time. Why Our Kids Love It: It’s a great excuse for getting their parents to give them some of their favourite snacks. It might be 17 years since the release of the first Harry Potter film, and 11 years since the release of the final book in the series, but the tales of the orphaned young wizard and his battle against He Who Must Not Be Named are still as popular as ever, especially with the release of the sequel to the Fantastic Beasts movie later this year. 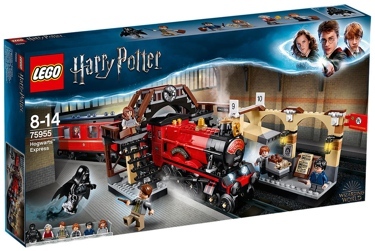 To coincide with the latest film, Lego have released a number of new Harry Potter and Fantastic Beasts themed sets, and it’s safe to say that the Hogwarts Express has been one of the most popular sets. The set recreates the scene where the dementors boarded the train and attacked Harry, who was rescued by Professor Lupin. It sold out when it was first released back in August and, thankfully, it is now back in stock, however, it might not be for much longer, given its popularity! Why We Love It: It’s packed with detail, including the entrance onto platform 9 ¾ and a trolley witch selling chocolate frogs. For those of us who grew up with Harry Potter and now have kids of our own, it’s bringing back some fabulous memories. Why Our Kids Love It: It comes with six minifigures, including Harry, Ron, Hermione, and a spooky dementor. 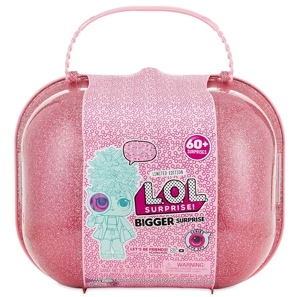 The L.O.L Surprise series of small plastic dolls were another big hit last year and continue to fly off the shelves. If you have never heard of them then you’re probably wondering what all the fuss is about. To be honest, so are we, but kids love them, in part because it fuels their innate desire to collect objects. The dolls and accessories come wrapped, so you are never sure what you will get, and there are hundreds of items to collect. Later this Autumn, in time for Christmas, a special limited edition set, Bigger Surprise, will be launched, containing around 60 items that are all individually wrapped. Most retailers agree that this is one that will sell out fast. 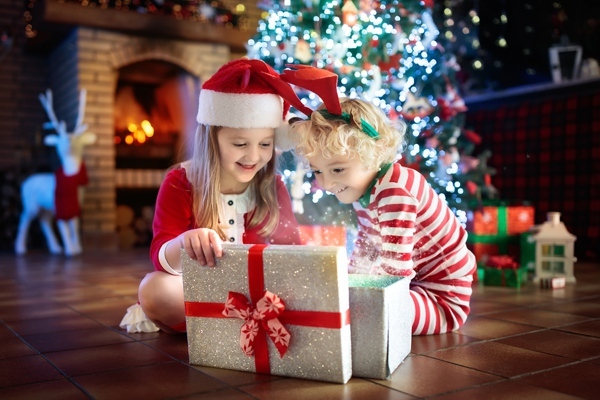 Why We Love It: It’s great for keeping the kids quiet as they spend an hour or so unwrapping every item. There are extra clues to search for as they tackle each layer. Why Our Kids Love It: It’s full of brightly coloured collectables. 2018 is the year when interactive robotic toys become the most sought after. 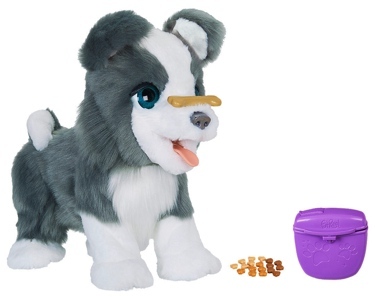 Ricky the Trick Lovin’ Pup is one such toy that is set to be one of the year’s top sellers. It’s the next best thing to a real life pet dog, with around 100 different sound and movement combinations that are activated in response to sounds, motion, and touch. Ricky performs tricks and loves being petted. You can even feed Ricky special treats, and then see “nature” take its course with the treats reappearing from elsewhere. It’s a fairly large toy that provides hours of entertainment. Why We Love It: If your child has been asking for a dog for Christmas but you can’t face the idea of daily walks, then this is the toy for you. Why Our Kids Love It: It’s cute, cuddly, and performs some pretty cool tricks. If you like the idea of a robotic toy but want something a bit more educational for your child as well as being fun, then check out Botley the Coding Robot from Learning Resources. 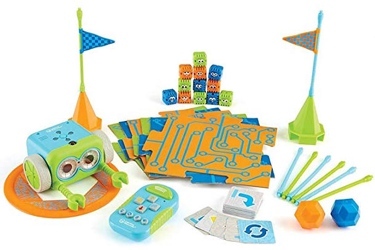 The main draw of this toy for parents is that it introduces the idea of computer coding (a vital skill in our future economy) without the use of screens. Children can programme the robot using special coding cards that can be arranged in numerous orders to create sequences for the robot to follow. They can use these sequences to make the robot move forward, turn, make a sound, and much more. Why We Love It: It’s a simple, yet fun way of introducing children to the world of computer programming. It’s both entertaining and educational at the same time. Why Our Kids Love It: There are lots of different combinations to try. The addition of a sensors means that your child can create obstacle courses for the robot to complete. Last year the hit doll for Christmas was Luvabella. It was so popular that some parents were driving hundreds of miles just to get their hands on one. However, for some of us the toy left us feeling a little uncomfortable, thanks to its slight resemblance to Chucky, a doll who was a little less friendly. If you were put off buying Luvabella for this reason (or for its eye-watering price tag) then the Chad Valley Tiny Treasures doll may just appeal. 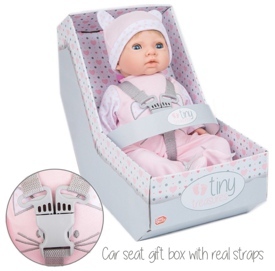 There’s no robotics here, but it has life-like facial features and it weighs about the same as a newborn baby. It even smells like a newborn baby. It comes with birth certificate and hospital tag, along with a cute baby outfit. Why We Love It: It’s not Chucky. There’s no sound effects, so you can enjoy some peace whilst your child plays. Why Our Kids Love It: It’s incredibly cute and cuddly, and it has newborn features, such as floppy arms and eyes that close when laid down. If your child loves Paw Patrol then they will love the new Ultimate Rescue range of Paw Patrol playset toys that have been released this year, including this giant fire truck that comes complete with a Marshall figure, which is the biggest vehicle in the series. 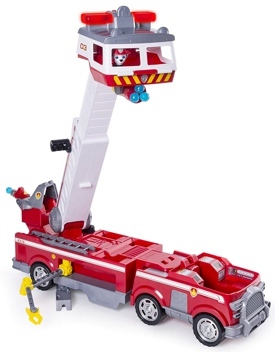 The truck features a 2-foot long extendable ladder, a water cannon that can shoot plastic “water spurts” and it has space for all six pup figures to sit (sold separately). There are lots of hidden elements for your child to discover and Ultimate versions of the other pup’s vehicles are also available. Why We Love It: It’s great for fuelling imaginative play, as your child can use to create their own rescue missions. Why Our Kids Love It: It features one of the show’s best loved characters, Marshall, and they can use it to give all the pups a ride. 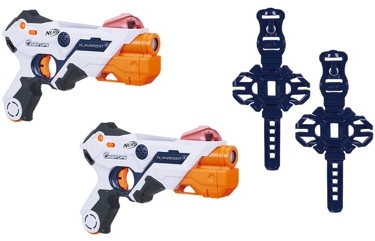 Nerf guns have seen a huge upgrade from their original design that used foam bullets. This Laser Ops Pro set uses infrared to register shots, just like the laser quest guns used in entertainment venues. Players must aim at each other’s blasters to score a hit, and the back of the blaster has lights that indicate the amount of ammo and health each player has left. You can add additional elements, such as the ability to track your opponents via GPS by linking the blasters to your smart phone via an app. The box includes two armbands that can be used to attach your phone to your arm. The game can be played inside or outside, with different settings for each. Why We Love It: Say goodbye to accidental Nerf shots in the face. This game will get your children active as they run around trying to avoid being targeted. Why Our Kids Love It: Whilst this set contains two blasters, friends with their own blasters can join in the fun, creating a giant game. 2018 is the year of the unicorn, at least as far as children are concerned. Unicorns can be spotted on clothes, bedding, cakes, jewellery, hair accessories and more. It’s no surprise then that unicorns are set to dominate this year’s lists to Santa. Toddler toy favourite Vtech have jumped on the unicorn bandwagon with Myla the Magical Make-Up Unicorn. 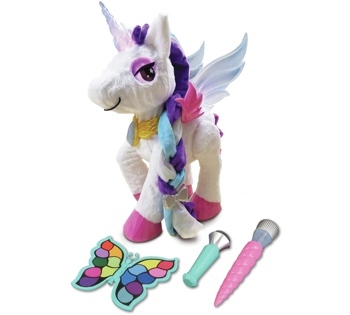 This clever interactive toy comes with a pretend makeup pallet and brush that uses sensors to magically change the colours of the unicorn’s makeup. It also includes a microphone so your child can sing songs with Myla, and by touching the unicorn’s back your child can hear a prediction from the unicorn for their day. Why We Love It: As the “make-up” is changed with sensors and lights your child can experiment with the idea of make-up without all the mess. Why Our Kids Love It: It’s loud, sparkly, bright, and continues the unicorn craze. New-Born and a Toddler? Tips on How to Cope. Think The Newborn Stage Was Difficult? Wait Until You Start Potty Training.